← Last Night Through the Eyes of a Runner. This Week’s Running Recap and Announcement! For all my amazing followers out there, thank you for being such a wonderful reader! It means a lot to me that I have fellow lovers of running, Americans, Australians, Blogosphere friends, and just plain old wonderful people encouraging me through reading my posts and interacting with them! As any of you regulars know, I post once a week on Wednesdays. And after a lot of thought, I am excited to inform you all I am now going to be posting twice a week! Once on Wednesdays and once on Sundays! As I learn more and more about running theory, running science, and training, I am excited to do a weekly post dedicated to nothing but running! (I mean this is a running blog, right?) My other post per week will remain a “Through the Eyes of” post! Bear with me as we try this out! Another feature of this new weekly post and post style will be a section at the end of every post that I want to ask you questions and get feedback and answers in the comments section because I LOVE interacting with you! 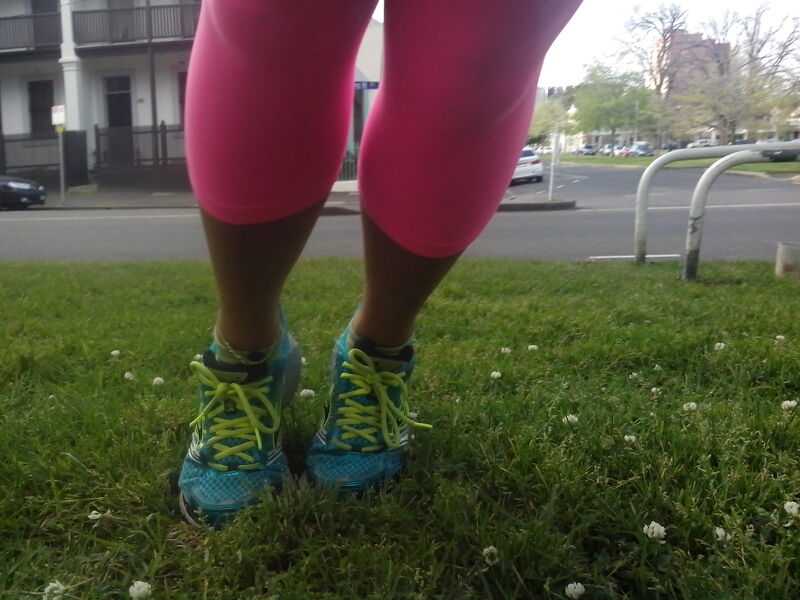 Since it is Monday (very close to Sunday) I will do my first dedicated running post! Starting next Sunday I will be posting on Sundays! I have a half-marathon approaching on Sunday! I have been very hush-hush about this training circuit since in the middle of it I got very sick and had to take some time off and was not positive I would be able to successfully complete the race without a bit of walking. But shouldn’t that give me all the more reason to talk about it?! As runners it is so easy to set standards for yourself that if you don’t reach or achieve you fall into the trap of not discussing that race, that run, that day, that workout, etc. But running is so much more than the standards we set for ourselves, its about overcoming the world and our minds one step at a time. Running is something that is good on every level, physically, mentally, emotionally. This type of positive activity never needs to be hidden, it is ALWAYS a good thing! This past week of my training circuit has been pretty relaxed, 6 miles maximum a day and a lot of beach and trail running! But this week I am getting that pre-race excitement!!! This morning I did my last long run of my training circuit, coming in with a 13.3 mile run at 1:58, it was by far the best run I have been on in my entire 2 month training circuit! I didn’t hit a wall, sang my way through (literally, outloud, people were looking at me like I was crazy, because let’s face it, I am), and just enjoyed every moment of the run! I go to the Expo on Thursday and am super pumped to see what the difference is between Aussie Expo’s and American Expos! 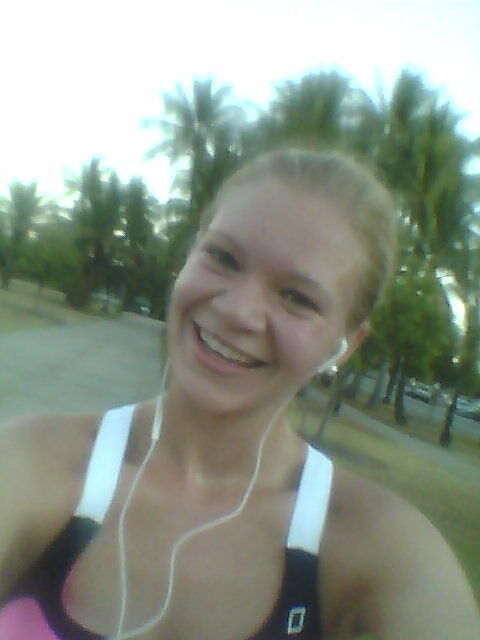 Selfies while being brave and running in a sportsbra in Cairns! And some post-run yoga and stretching in super bright colors! I am a terrible runner. I love group classes like zumba, spin and body pump, though. Zumba and Body Pump are my favorite cross training!!! More power to you with the spin classes! I’m so bad at spin! I go in spurts with running—right now I’m a walker. 😉 Cute running shoes! Yayyyyyy!!! One more post from an amazing friend 🙂 good luck on the half marathon !!!!! Thank you so much Bree!!!!!!!!!!!!!! It means so much that you keep up with my blog 🙂 And thanks for the luck! Keep it up girl! Keep on inspiring others! I’m more of a walker than a runner but I have a knee injury right now so that is very limiting. I really like bright colors though. Pink and purple are my favorite. Oh! Injuries are the worst! I’m hoping it gets better soon! And right on with the bright colors! For working out there is nothing better! Sending good vibes for your race! That’s so awesome! I wish I was a runner, but I have a knee injury so it’s a no go for now. I’m excited to learn more about running from your blog! I really enjoy yoga though! Thank you for the encouragement and love Zoe!! Yoga is so good! I wish more than anything I was more flexible so Yoga was easier but it is so much fun and you always feel awesome afterwards! You’re so inspiring, I need to get back on my treadmill. I’ve gained about 20 pounds from last year around this time. Now’s the time, right?! Fall is the perfect time to start your new workout circuit, or even just adding a little jog or long walk here or there! I’d love to be of encouragement along your journey! I love how dedicated you are to running! One of my friends from college just recently ran her first half marathon, and I was so proud of her! I’ve only done a 5k, and I walked it haha. I’m not big on running. I tried to be, but I just couldn’t stay dedicated. It’s a shame, really. This is exactly what I needed– some inspiration to run! Thank you!!! Thank you Daisy!!! If I could be of any help in encouraging you, helping, and just being there in the journey, just reach out!! I for sure need inspiration to run. This def helped me! Hopefully I start to run this week!! I’m determined to do a half marathon at some point this year or next year! What are some tips for people who are starting to go back to running? I’m so glad to have been an encouragement to you Olivia!! This is exactly the point of the running blogging 🙂 I would love to help you get to your goal! It is the most amazing feeling to run a half! I LOVE it!!! Some tips would definitely be don’t give up! Your mind WILL tell you no, you just have to ignore it!! Another tip, stretch always! For at least 10 minutes even after a mile or two, I made this mistake and two years later am paying the price for it! I’ve been traveling for the last week and I’m traveling again this week so I don’t see a workout in my future. I could count airport walking as a workout though, right? I’ve never liked running! Good for you to continue your training, I look forward to more blog posts! I haven’t had a true workout in a long time. Does running from store to store and still getting some writing in count? Wow that is awesome! I don’t have the stamina to run. I prefer workouts like Yoga and Pilates with a little cardio added in here and there. But good for you! I love you too Angel and miss you!! Can’t wait to see you in December! my favorite workout was last April.. i need to get back into it.. You look very happy going for your run! Haha running is actually one of my favorite things! I was quite happy 🙂 Thanks for reading! I don’t run due to Spinal Stenosis, but I do water aerobics which I love. Water aerobic is awesome!! I would love to give it a try! I’ve recently made the decision to start a work out regimen ans tick to it regardless of my busy schedule. Hopefully I’ll work my way up to the running part sooner than later. I can’t run to save my life. Good luck at your marathon. Thank you so much Nolie! I don’t do much running. I do like walking and do that quite often. My favorite workout color would have to be red. I miss running and wished I could still do it. I love the pink colors for running as well. Maybe one day soon! Goodluck Bonnie 🙂 And pink rules! My fav color is green so i guess that makes it my favorite running color? I don’t actively work out so… no favs there. Haha it definitely counts!! 🙂 Green is my favorite color too! Good luck in your marathon! I’m not a runner, so I congratulate your dedication. Thank you so much Nicci! My workout this week has been chasing my children around! Sounds like you had a great week! That is the most exhausting workout ever!! I only babysit a day at a time and they wear me out! Congrats on a growing site! You look particularly happy in the post run selfie! I hope you meet your goals at the marathon. Thank you so much for the encouragement Elizabeth! I’m super excited for everything God is doing! I joined a gym this month, so I am enjoying all my workouts. I love cobalt blue and black for my work out clothes, but love your pink clothes! I’m more of a walker, but I do walk very fast! Glad to see that you’re adding another blog day every week! I’m so not a runner, but I love walking! I use to walk 3 miles everyday! That is amazing Alyssa! Keep up your miles! I’m a walker and occasionally yoga. I don’t do either nearly as often as I should. I don’t have any color preferences although I usually lean towards earth tones. Yoga is so difficult 🙂 More power to you! And oooh earth tones are nice! I actually need to get some! I’m not a runner at all but like to go for walks. Keep up the good work with your running! Thank you for the encouragement Louida! I used to love running and my favorite color to run in was purple. Since I had foot surgery; running became unbearable but hope to get back to it by next year. Awww I’m so sorry to hear that Tamika!! If I can be of any encouragement in this difficult time please let me know!! I love running or speed walking! It always makes me feel so good. I have a thing with my foot right now and haven’t been able to run in a few months and I really miss it. Awww that is the WORST when you can’t run for something! I was sick a couple months ago and it killed me to be out for a couple weeks! I hope it heals up quickly!! Congrats on posting twice a week instead of once. I don’t run a lot at all anymore but I do walk. Thanks for sharing and Good Luck on your half marathon Sunday. Thank you so much for the encouragement Rebecca! Favorite running colors? I do not really run but I love white and pink. 😀 Good luck on your training and your upcoming marathon! Hope you won’t get sick again. White and pink are good for everything right! So far the sickness is holding off!!! Whoooo! 🙂 Thank you so much Jo!! I am not a runner but a ‘walker’. This week my husband and I have gotten off the couch and started walking our yard.. better than nothing, right? WTG! That is a big kudos to you! I try to put some running into my workouts. I even do what i call intervals- walk then run then walk…works great! Way to go on the run! Cute shoes too. Good luck on your half-marathon. I’ve been starting to run a little more in my life. But only in intervals while working out. I can’t do distance running, although I know it would be wonderful to do that outside. Thank you so much Barbie!! That is so exciting! They say intervals are some of the best cardio you can do! Keep up the workouts! Congrats on moving your blog up! I’m excited to learn more about running!! Thank you so much Raewyn! I’m a runner too, so I’m looking forward to your new blog posts! I’m so happy to find other runners out there! Thank you so much Xiomara! Haha the kids are one of your best workouts! Keep up the good work Melissa!! Good luck on your marathon you have on Sunday! I think my favorite “workout” would be a good hour or two cardio workout playing Just Dance with my kids. Thank you so much Natalie! Oh my goodness!! That is such a fun workout!!!!!!!! I love your dedication and your running outfit!! I wish I could get into a running routine! I love your dedication and your running outfit! I wish I could get into a running routine!